DC/DC power modules for the industrial and railways sectors have been introduced by Flex Power Modules. They are provided in sealed and encapsulated packaging, for operation in harsh conditions, such as being subjected to dust, moisture and severe vibration. For industrial applications, Flex Power Modules provides reliable, high performance and rugged DC/DC modules in standard form factors. They often run from 24 or 12V supply voltages, rather than the 48V options commonly found in information and communications technology (ICT) applications. For railway applications, there is a series of products that can meet the most stringent electrical and environmental specifications. Railway systems today need a range of DC/DC converters to power different monitoring and control units. The company’s DC/DC modules support a wide range of input voltages, to cover the needs of different applications. For industrial products, this includes 9.0 to 36V, 18 to 36V, 9.0 to 75V and 18 to 75V. Other modules provide input ranges of 43 to 160V and 66 to 160V, to cater to different railway application bus voltages, including 72, 96 and 110V. Flex Power Modules offers five ranges: the PKV Series (1.65 to 3.0W), PKE 3000 Series (15 to 30W / Vin at 9.0 to 36V), PKE 5000 Series (15 to 30W / Vin at 18 to 75V), PKE 8000A Series (40W / Vin at 9.0 to 75V) and PKM 7000A Series (100W / Vin at 66 to 160V). Products in these ranges are suitable for a range of applications, including factory automation, robotics, alternative energy, smart grid, process control and test and measurement. 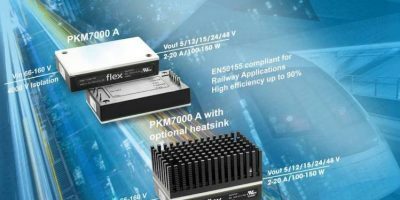 More families and additional input and output voltage combinations will be added in the coming months, says Flex Power Modules.